A blog about moments that I experienced when watching movies and television series. This was one movie that I had been waiting for since few months ago after I saw its trailer. I thought this would be a wonderful movie and it showed signs of going to be a movie with epic battle. Due to some reasons though, Indonesia was a bit late to have the movie's premiere. The film only played starting yesterday (almost 2 weeks latter than the U.S). It was a bit disappointing for Indonesian movie goers that some summer blockbuster movies are now playing few days or weeks late, even months (such as Cars 3 which would only play in August or Baywatch that only played last week and few other examples). Well at least they still played in theaters though, rather than having them completely bypassing us and we had to see those movies in cable TV or live streaming. Anyway, let us get on with the movie. Story was told few years after the story in Dawn of the Planet of the Apes where the Ape leader Caesar (Andy Serkis - as Gollum in Lord of the Rings & The Hobbit trilogy etc) was hiding in a secret cave with his tribe. Caesar always tried to avoid confrontation with the humans due to the previous war ignited by his friend Koba (Toby Kebbell - Kong: Skull Island, A Monster Calls etc). However their peace was short lived as they were attacked by a military team who was supported by few of Koba's former team who refused to follow Caesar. Caesar decided that it was time to leave their location and moved to another place far from humans' reach. But one thing led to another and he changed his mind and wanted to attack the humans army leader called The Colonel (Woody Harrelson - The Hunger Games series, Now You See Me 1 and 2 etc). He was accompanied by the wise orangutan Maurice (Karin Konoval), the big gorilla Luca (Michael Adamthwaite) and the chimpanzee Rocket (Terry Notary). The rest of the tribe would be departing to the new location which they would call "home". Meanwhile The Colonel was also very adamant to kill Caesar. During this journey to kill the Colonel, Caesar would encounter lots of challenges including his own internal struggle to avoid becoming another Koba. It was a good thing that Maurice was also there to accompany him. They also would later be joined by a funny chimpanzee who called himself Bad Ape (Steve Zahn - Dallas Buyers Club, Captain Fantastic etc) and a human girl (played by newcomer Amiah Miller). So could Caesar complete his "mission" and kill The Colonel? Would the Apes be able to reach their "home" so the war could be stopped? Find them all in this great story of humans against "beasts". After watching this movie and finally completed the trilogy, I was having a bitter sweet feeling. It had a great ending, a just and wonderful end. I was literally remembering the first time I saw Rise of the Planet of the Apes with Caesar's story from his childhood till he became the leader of the apes and his way of life & the great war in Dawn of the Planet of the Apes while watching the end scene. This movie really did gave us a sense of closure and I personally feel that this trilogy was a really complete one. It would be very bad if they wanted to make another sequel to this one, and it would probably be a lot more difficult to remake this trilogy since this was a very very good one. Now I can also understand that a movie of apes may not be to the liking of general audience, especially if the first and second one have never been watched before. But this movie was so good that I would really recommend to watch it completely, that means see the first two movies before seeing this one. I would not recommend to watch this as a standalone movie since it was having a direct continuity with the previous movies. 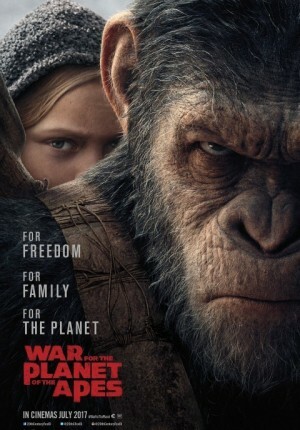 My wife and I enjoyed this one due to its powerful story and the great performance of Andy Serkis as Caesar. Both of us felt that Caesar's characterization was very good as we thought that he has a very strong presence and he really seemed to be authoritative figure. It's like we really believed that apes would honor and respect him. We also loved the character of Maurice and obviously the funny Bad Ape who provided comical and funny moments (sometimes in the most unexpected scenes). Woody Harrelson was also very convincing as a "crazy" sadistic military leader. There was something that was not to my expectations though, which was the movie did not have that many fights, but the epic battle in the end really made up for it. And for myself, it did not make it a boring movie since Caesar and his ape friends' journey were really wonderful to see. Again their characters were really humanlike that you would almost forget that you were actually watching the apes rather than humans. The special effects of this movie were fantastic, especially the makeup effects of the apes. The sound effects? Super cool. It was having a Dolby Atmos system which was a good thing for us to see it in the cinema with such system. Some of the scenes were shot in the forest which made it even nicer as the sound effects made us feel we were literally in the forest. The musical score was also wonderful especially during the intense moments or the touching moments. Finally, if you are a fan of the Apes movies (take note that this trilogy was actually a reboot of the previous movies from 1968-1973) then you really should watch this one to complete the story. I am sure that if you have seen them like I did, this one would surely give you the satisfaction. But if you have not watched the previous movies before and seeing Apes that could talk is not your thing, then probably it would not be a good idea to watch this. However, as I said earlier above, if you want to try and see what the fuss is all about, you better make sure that you see Rise of the Planet of the Apes and Dawn of the Planet of the Apes (by the way you could see the cool way of showing those wordings in the opening scene) before seeing this. I think Matt Reeves, who was also director of Cloverfield did a wonderful job directing this movie. It is too bad though that the movie did not perform especially well in the box-office. Good thing this is the last installment so we do not need to worry about having no conclusion if the next movie was never made. I never claim to be a movie critic. This blog only represent my personal view and movie experience. It is not meant to be a smart analysis of the feature of the films like script, musical score, acting, directing or any such things. If you are looking for any of that stuff, other blogs may suit you better.